His confirmation marks a major victory for President Trump. The Senate officially confirmed Brett Kavanaugh Saturday as the next Supreme Court justice -- but the vote, like the controversial confirmation process, was anything but smooth. Protesters in the public viewing gallery regularly interrupted the vote, screaming "Shame! Shame! Shame!" and causing brief upsets in the roll call vote. 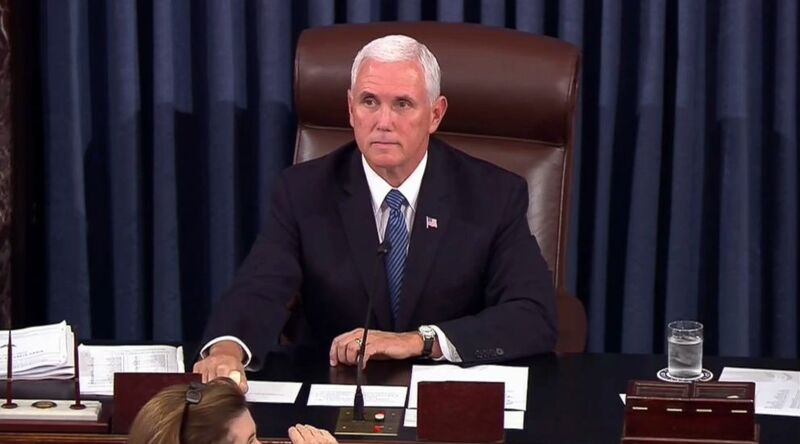 Vice President Mike Pence, who serves as the president of the Senate, had to repeatedly call for the sergeant at arms to restore order in the gallery. "I do not consent! Where's my representation?" one female protester screamed before being forced out of the chamber. (APTN/AP) Vice President Mike Pence calls for the Sergeant at Arms to restore order in the Senate gallery as a protester yells during the start of the vote for the confirmation of Brett Kavanaugh to the Supreme Court in Washington, Oct. 6, 2018. Kavanaugh was sworn in late Saturday by retired Justice Anthony Kennedy, whose spot on the court he will be taking, and current Supreme Court Judge John Roberts. 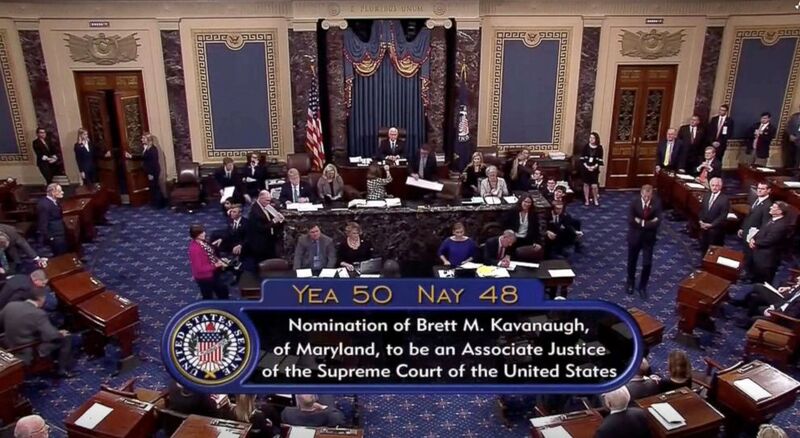 In the end, the vote came down as anticipated, with 50 votes in favor, 48 votes against, and 1 present, confirming Kavanaugh as the next justice in the highest court in the land. Sen. Lisa Murkowski, R-Alaska, noted that she would like her vote to be marked as "present," in a logistical maneuver aimed to address the fact that another Republican, Sen. Steve Daines of Montana, was unable to attend the vote because he is scheduled to walk his daughter down the aisle at her wedding. Daines wanted to vote in favor of Kavanaugh, so Murkowski paired her vote with his so they would cancel one another out -- she would have voted against Kavanaugh. (Senate TV via Reuters) A still image taken from video of the final tally of votes by the U.S. Senate on the confirmation of Supreme Court nominee Judge Brett Kavanaugh, in Washington, Oct. 6, 2018. President Donald Trump tweeted shortly after the vote, congratulating the Senate and his nominee. "I applaud and congratulate the U.S. Senate for confirming our GREAT NOMINEE, Judge Brett Kavanaugh, to the United States Supreme Court," he tweeted. "Later today, I will sign his Commission of Appointment, and he will be officially sworn in. Very exciting!" Kavanaugh and his wife were seen in a black SUV entering the Supreme Court to be sworn in Saturday night. 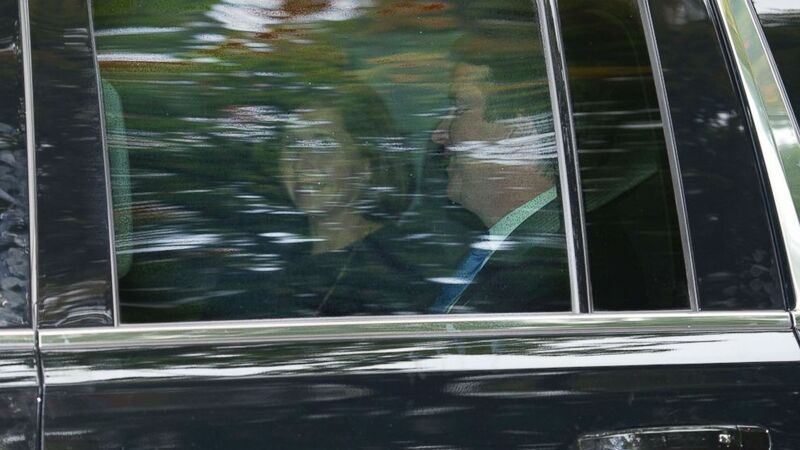 (Cliff Owen/AP) Supreme Court nominee Brett Kavanaugh and his wife Ashley Estes Kavanaugh depart their home in Chevy Chase, Md., en route to the Supreme Court, Oct. 6, 2018. Trump spoke briefly from the White House lawn before the Senate vote session started, saying that "in the end maybe the process, it was really unattractive, but the extra week was something that I think was really good. I thought it was really good. I think a lot of very positive things happened in the last week. It didn't look that way but in the end, that's what happened." As for Kavanaugh, Trump said "he's going in looking really good." (Mark Wilson/Getty Images) President Donald Trump speaks to the media about the upcoming Senate vote on Brett Kavanaugh before departing the White House, on Oct. 6, 2018 in Washington. White House press secretary Sarah Sanders said that Trump called Kavanaugh to congratulate him while onboard Air Force One as he headed to a campaign rally in Kansas. Trump told reporters that his speech in Mississippi on Tuesday, days before the vote, had an effect on Kavanaugh's nomination. During that speech, Trump appeared to mock Christine Blasey Ford's testimony about her alleged assault at the hands of Kavanaugh. The judge has denied the accusations. "I think the Mississippi speech had a great impact, yes. I think it was a very important thing," Trump said on the plane Saturday. "He was chosen for the reason of his temperament, his incredible past, his outstanding years on the court. 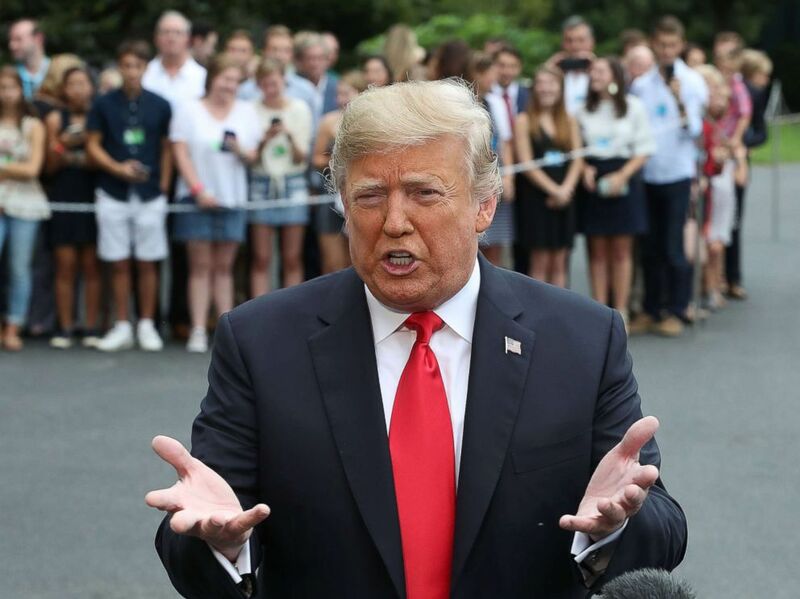 He’s had an outstanding record, a brilliant scholar, a totally brilliant scholar -- top -- and we’re very honored that he was able to withstand this horrible horrible attack by the Democrats," Trump said. Kavanaugh's confirmation essentially became a done deal on Friday afternoon, when Maine Republican Sen. Susan Collins, a key undecided vote, announced on the Senate floor that, despite allegations of sexual assault and misconduct against him, "I will vote to confirm Judge Kavanaugh." Just hours earlier, with Kavanaugh's fate still uncertain, the full Senate had voted 51-49 to end debate and advance the nomination, after an additional FBI investigation seemed to turn up nothing to corroborate the allegations. "This is not a criminal trial, and I do not believe that claims such as these need to be proved beyond a reasonable doubt," Collins said in a lengthy speech defending her decision. The Maine moderate Republican faced heavy political pressure, including from women who came from her home state and demanded that she side with Kavanaugh's chief accuser, Ford. Collins' declaration of support for Kavanaugh was quickly followed by West Virginia Democratic Sen. Joe Manchin, another key undecided vote, who issued a statement saying he, too, would vote "yes," giving Senate Republican Leader Mitch McConnell the support he needed to get Kavanaugh confirmed, even if by one of the narrowest margins in history for a high court nominee. Ford's attorneys said their client has no regrets. "I think she feels good about the fact that she came forward and did what she felt strongly was her civic duty to do, which is to provide the information she had to the Judiciary Committee so that they could make a better decision -- a more informed decision," her attorney Lisa Banks told ABC News' Congressional Correspondent Mary Bruce. When asked if Ford will ever be able to live a normal life again, her lawyer seemed optimistic. ABC News' Trish Turner and Jeffrey Cook contributed to this report.